In almost every American community there are small churches and megachurches, churches in storefronts, country churches and fancy churches. The true Church of God was to continue long after Jesus ascended to heaven, but what is it and how do we know? Just what was to continue? The apostle Paul further clarifies who or what the Bible means by “church” in 1 Corinthians 14:23. He tells the Corinthians, “If the whole church comes together in one place. …” If the Church can “come together,” it certainly doesn’t sound like it is a building—but rather something else. The word in the Greek language (the New Testament was written in Greek) is ekklesia, which means “a calling out,” especially “a religious congregation, an assembly” (Strong’s Exhaustive Concordance, #1577). The word designates the body of believers of which Jesus Christ is Head. It can designate the entire group worldwide, or it can designate a particular local group of individuals. Thus when Barnabas and Paul “assembled with the church,” they were assembling with and teaching a group of followers of Jesus Christ. Who calls someone to be part of God’s Church? The Lord adds to the Church those who are being saved (Acts 2:47). It is God, through Jesus Christ, who adds to His Church (John 6:44). People cannot simply build a building and call it the church, as so many try to do. Rather a person is called by God and answers that call, like a person answers a call on the phone. A true Christian is a person God has selected and “called out.” The process isn’t simply “joining the church of your choice.” You cannot simply choose to join His Church—but must be called by God, through Jesus Christ before making that commitment. Colossians 1:18 states very clearly that “He [Jesus] is the head of the body, the church, who is the beginning, the firstborn from the dead, that in all things He may have the preeminence.” God’s Church has one head, Jesus Christ, and is one body. This is an important fact to consider. God’s Church was purchased with the blood of Jesus Christ. In Acts 20:28 Paul, in talking with the elders of the congregation in Ephesus, tells them to take heed of the flock “among which the Holy Spirit has made you overseers, to shepherd the church of God which He purchased with His own blood” (emphasis added). Those called out by God will be united in following Jesus Christ. They will follow Him and will obey Him. God’s Church will be “shepherded,” guided, led and protected by Jesus Christ and His chosen shepherds. Those called out by God will be united in following Jesus Christ. They will follow Him and will obey Him. God’s Church will be “shepherded,” guided, led and protected by Jesus Christ and His chosen shepherds. The last part of Ephesians 5 describes marriage and uses Christ and His Church as the example. In verse 24, Paul tells us: “Therefore, just as [in the same way that] the church is subject to Christ, so let the wives be [subject] to their own husbands in everything.” The true Church, the body of called-out believers who are following Christ, will be subject to Him in everything. His Church will be striving to behave itself just as Jesus Christ did when He was living on earth. If the Church is to “follow Christ,” why are there so many different churches with different teachings? 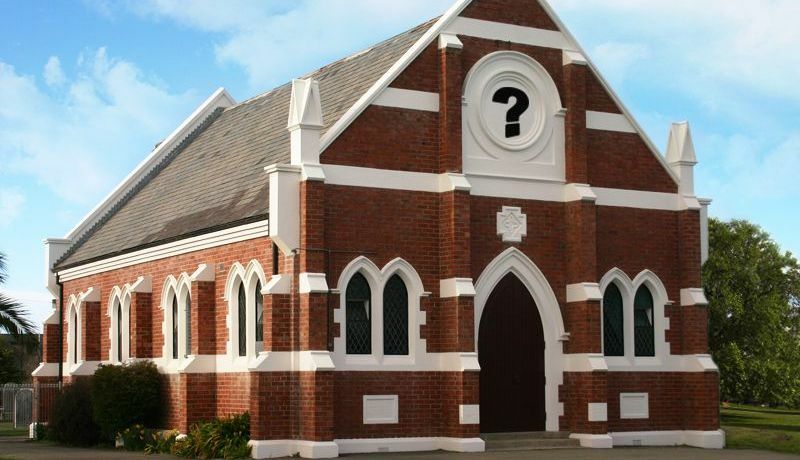 How should you determine which church to attend? What happened to the early New Testament Church? These questions and others will be addressed in future articles on this website. Since we have seen that God’s Church is a group of called-out believers who are following Jesus Christ, what about church buildings? Does the Bible say anything about them? In addressing Philemon, Paul sends greetings to “Philemon our beloved friend and fellow laborer, to the beloved Apphia, Archippus our fellow soldier, and to the church in your house” (Philemon 1:1-2). In all three of these passages God’s Church is said to have met in someone’s home. There was no separate “church” building. In other cases in the New Testament, Church members met in the Jewish synagogues or in other locations. Locations and facilities were not really important, but what was important was that the teachings were to be in accordance with what Jesus Christ taught and did. That doesn’t seem to be the case for many today. Today, people are attracted to a church by the size or the beauty of its building, the social programs, the music programs or the sports programs. But the building location or size, the status of those who attend it, the programs offered, the adornments or other physical things don’t make a church. The building is just a building—an empty shell. To learn more about God’s Church and being part of it, continue to read the related articles in this “Change” section of the website and our free booklet Change Your Life!